Home » Community • School » Where are they now? 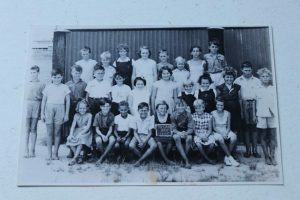 A class from 1955 – where are they now? So many people worked very hard to make a new, improved six-million-dollar school a reality. While the school construction broke ground in 1998 and construction began, a team began looking into making decisions about everything from new school uniforms to carpet colours and a unified school culture. A facility that would accommodate a more complex school than Tin Can Bay had ever seen before. An education centre for not just prep and primary classes, but also a special education unit and high school classes to Year 10. Let’s face it the old school site was awesome, but the buildings were old and as our school community grew we quickly ran out of space. As a teacher who had worked in the old Tin Can Bay school site, it was exciting to move to our new shiny school, 20 years ago. This new school offered so much: new classrooms, space, an oval twice the size of most primary schools and opportunities for our children to stay close to home for longer, so they didn’t need to make the long trips to Gympie each day. But a school is so much more than a group of buildings. Over the last 20 years we have had four principals, a few acting principals and other members of the administration team, hundreds of teachers and support staff and thousands of children. Tin Can Bay P-10 school has hosted massive sporting events, art events, social and community events and has not been afraid to colour outside the lines. Programs like YACCA, marine studies, Year 7/8 program (long before it was compulsory to have Year 7 in the high school program), advanced science, industrial design and technology, to name but a few. Each and every program was designed to support the needs or interests at the time. As a teacher who taught at Tin Can Bay for 21 years – until leaving at the end of 2017, I have many fond memories of amazing children, supportive and inspirational families and brilliant and hard-working staff. What I loved the most about being a teacher at Tin Can Bay was having the opportunity to watch so many children learn and grow from small people in a tiny town to forward-thinking, independent adults who have gone out into the big wide world and found success, personally, academically, socially and vocationally. I remember fondly on many occasions former students calling into the school or approaching me in the community to introduce me to a boyfriend, girlfriend, tell me about their new job, show me a photo of their car, child or house. Young men and women who have gone on to become successful builders, teachers, retail workers, truck drivers, florists, a member of the military, mechanics, plasters, plumbers, marine biologists, business owners, surveyors, supervisors, environmentalists and park rangers, to name but a few. This year at the 20-year celebration of the new school site it would be amazing to share some of these success stories with the current school students, staff and community. We would love you to send a brief email to Mrs Annette Bailey – (abail47@eq.edu.au) tell us your name, how long you were a Tin Can Bay student and your success story so far. What are you most proud of? Send a current photo so we can display you and your story. Better still come along on October 13 to the 20-Year Back to the Bay Celebrations. We would love to see you there! How many schools go fishing for a day?